If it feels like the population of Toronto and the GTA is aging, it is. According to census data, the number of people 65 or older has nearly doubled since 1960. A good number of those seniors will be moving in with family members as they become less able to care for themselves. This can be a significant strain if living space is already limited in your home. If you've got a basement crawl space, or even better yet, an exposed basement wall, you've got the makings for a new in-law apartment. There are many reasons for lowering a basement, and converting a crawl space or unfinished basement into a much-needed living area makes great financial sense. For a fraction of the cost of an above-grade addition, you can create a private space for your loved one with easy access to the rest of the household. It's always important to follow safe building practices and code requirements, so check with your local building department to clarify what is needed for excavation, electrical and plumbing re-routing and concrete construction. A complex underpinning project will require a considerable investment of time and resources. However, you should keep in mind that you'll increase the value of your home by a sizeable amount. Real estate agents regularly categorize basement finishing among the most valued improvements for increased living space and potential rental income. Some expert engineering advice may be needed before you begin your remodeling project. Stamped drawings noting the proper excavation level, footing arrangement and plan for moving and extending load-bearing walls are required by most municipalities prior to issuing the proper construction permits. A careful design plan should also precede any construction. You'll want to layout locations for the kitchen, bathroom, living room, eating area, windows, doors and mechanicals. A clear understanding of the specifications needed for each component will help you meet your remodeling goals and stay on budget. Re-routing the furnace connections, ductwork, water heater and other equipment to another location is the first step in this project. Vertical jack supports will hold the building from sagging while the underpinning is being done. Steel or wood beams are temporarily used to distribute the weight of the home above and then removed once the new, weight-bearing foundation is complete. There are four different methods for completing the underpinning process. In each case, the excess soil under and around the basement must be excavated and removed. This stage of the process is the most labor-intensive as it can be done by hand with shovels or backhoes and soil loaders. Of course, using heavy equipment will cost more but save a great deal of time and labor. The traditional mass concrete underpinning method is often used when the foundation needs strengthening. Weak soil underneath the foundation is removed and replaced with a concrete slab. Obviously the concrete is much stronger than the soil it replaced so provides a more efficient distribution of weight. Using a beam and base method involves both traditional mass concrete bases and concrete beams to support the foundation. It balances the load evenly while giving more support to the entire structure. Underpinning with a mini-piled system transfers the structure load to more stable soil deep underground. This technique uses 15 cm to 30 cm steel-encased piles that are driven 5 to 15 meters below the current footers through pre-drilled holes. The last method requires removal of the current concrete floor. Excavation is done one section at a time and then filled with concrete. The space between the old and new concrete is filled with non-shrink grout. At this stage, the walkout basement access points will need to be framed out. Local building codes will require the basement bedroom to have a safe, direct egress feature such as a door or full-size window. A walkout basement will accommodate this requirement and provide a private entrance for your family member. A door opening can be cut with a concrete saw. Next, a sill plate, support beams and door are installed. Weather-stripping should be used to protect the room from weather damage and heat loss. A full-size window opening can also be cut with a concrete saw. This feature will allow in plenty of natural light and fresh air. The new, full-height basement area that has been created will need to be waterproofed to maintain a dry living space. Extended foundation walls should be protected from hydrostatic pressure with an external waterproof membrane. As susceptible to water leaks and flooding as other parts of your basement, you'll want to ensure your in-law apartment will be a safe haven for your family member. The addition of internal weeping tiles, a sump pump, internal membrane or waterproof coatings will provide peace of mind for all household members. The internal drain tile system can easily be added before the floor is poured. A trench should be dug around the entire perimeter of the room. Next, lay gravel in the bottom, install the perforated PVC pipe and membrane, and direct it to the lowest point of the room. This is where the 2-feet deep by 18 inch wide sump pump reservoir should be placed. A layer of gravel should line the bottom and then a submersible or pedestal sump pump installed. It should be connected to the drain tile you previously put in. Test the pump and make any adjustments before pouring the floor. A 4- to 6-inch layer of gravel should be spread evenly across the new basement area. You're now ready to pour the new concrete slab. Curing for several days will ensure a solid base for your finished surface. The walls, ceiling and floor should be coated with liquid waterproofing for this application. It will penetrate through the concrete pores and bond well to create permanent waterproof surfaces. Use mold- and moisture-resistant products such as rigid foam insulation; below-grade, paperless drywall; fiberglass mat joint tape; mold resistant joint compound and acrylic waterproofing paint to improve air quality in this typically damp environment. The paints come in a variety of contemporary colors to match your furniture and accessories. Vinyl, laminate and synthetic-fiber carpeting are all excellent choices for basement flooring. Each provides moisture resistance and an attractive, yet durable finish. To function independent of the main house, your in-law apartment must be equipped with a kitchen and bathroom. Electrical and plumbing options should be reviewed carefully to make sure they are sufficient to handle the extra load. Additional circuits should be added to your main electric panel box for lighting and receptacles. There are several bathroom products available for lower level use such as self-contained toilets and high-performance pumps that don't require a lot of extra work to install. There are new selections available for cabinets, sinks and appliances that will add decorator touches while still fitting into the small footprint of the basement space. To make the rooms cozy during cooler seasons, include electric baseboard heat that can be controlled by a thermostat. Running a dehumidifier in the warmer months will help eliminate any excess moisture and make the rooms more comfortable for Mom or Dad. Don't forget to finish the exterior area of the walkout basement. Beautiful landscaping, a deck, patio or walkway can be included if you have the room. If the area is limited, consider a small walk out space with a decorative wall around a finished patio. 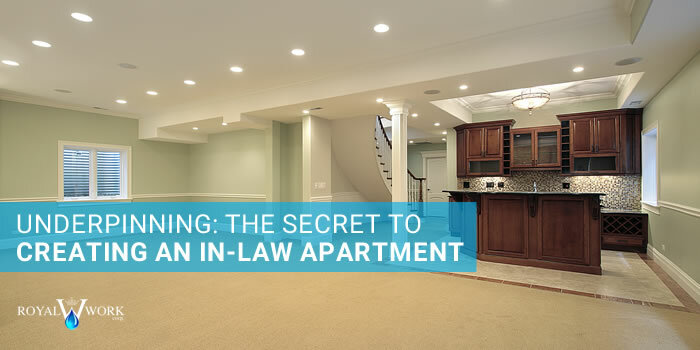 As you can see, underpinning is a practical and cost-effective means of adding an in-law apartment to your home. By utilizing an area that was under-used, you'll add significant value to your home and create an amazing atmosphere to spend quality time with your family for years to come. Remember, if you need some expert advice or professional assistance on your underpinning or walkout basement project, call Royal Work Corp. Waterproofing. Our experts will be happy to help.